If you happened to watch Fated to Love You (it's a Taiwanese Drama) in the past, there's another drama that has similar plot called Drunken to Love You. It was directed by the same director, Chen Ming Zhang. FTLY was one of my favorite drama. It's really touching and i would recommend it if you haven't watched it. It's a MUST-WATCH drama. Since i got my GMail account few years ago, i never switched back to my previous YahooMail. I used YahooMail only for Yahoo Messenger and it's not my primary email again. I just switch to GMail and i don't think i will move out from GMail. It's a great product by Google and they keep improving it bit by bit by adding more and more tweaks via Google Labs. But not everyone have their own GMail account and sometimes i wondered why? Is it because they already have too much messages on their inbox? Or they have too much contact to informed? 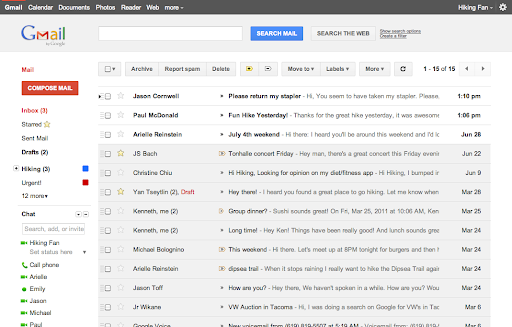 Google has created a new campaign called Email Intervention to help users migrate their friends who hasn't use GMail. Simply follow three steps to invite and personalize it to your friends. I think it's a good campaign, but i believe they could do better if they use their first video about GMail. I think it's still as amazing even though it has lived for years. Oracle has officially released Java 7 to public. It's been few years since a major upgrade to Java and this is Oracle's first major release of Java since the acquisition of Sun in 2009. Just like the usual process, a major release will bring a lot of new features such as a new Filesystem API, support for asynchronous I/O, a new fork/join framework for multicore performance, improved support for dynamic and script languages, updates to security, internationalization and web standards and much more. All of these are well-documented on Java's Release Notes. It seems my previous bug on Echofon has been fixed in the latest Beta version of Echofon 2.2. Echofon has posted on Twitter that they released Echofon 2.2 Beta 1 and it fixed the problem. On the next post, they also admit that the empty timeline affects Linux version of Echofon 2.1.1. For some time, i have been a driver when my parents went to other town. Since i don't hire a driver and i can drive since i was in junior high school, i'm always the one who drove the car. Well, that's not the case i had today as my fiancee and her mother hired a driver to drive us to Semarang and back to Jogja. He has a good driving skill and also lots of experiences, since he was a bus/taxi drivers in the past. July is nearing an end and we will have a new major version of Firefox by the end of this month: Firefox 6. It's in Beta 3 right now and i believe they will just release one RC and marked it as a final release or probably just skip it and directly goes to final release, depends on the situation. Anyways, i personally don't really like the idea of Mozilla new release cycle. It would make a burden for the vendors to maintain the applications, as there are no separation between a security update and a maintenance update. With the new release cycle, both are incorporated and new version will come up in the next three months or so. I prefer the old one actually. Creating documentation is a boring task for developers. They tends to write codes rather than documentations. Lack of documentations is one reason why applications become harder to maintain in the future because the writer of the code often doesn't have a coding standard guide which is understandable by other writers. Carla Schroder has written a nice article about a tool which can help developers to create documentation automatically. It's called Doxygen and of course, it's open source. It's included in almost every Linux distribution, so you won't have problem finding it. It has wide range of programming language support, including C++, C, Java, Objective-C, Python, IDL (Corba and Microsoft flavors), Fortran, VHDL, PHP, C#, and to some extent D.
I was very disaapointed with Ubuntu 11.04 release. Even though many people has said that .04 release were always a bad release, i didn't believe that until i saw 11.04. It was really the worst Ubuntu release i have tried so far and i believe many others will have the same opinion as i do. It's like the test case for Canonical to try new features. Others also said that .10 release is a nice one and based on the report by CRN, they are about to tell us a good news: Ubuntu 11.10 is fast and friendly. Even though it's only Alpha 2 version, it's quite stable, but still not recommended for daily or production usage. You should wait for the final Ubuntu 11.10 which should be released on October 28 if there isn't any major delays. The one mentioned on Mozilla's Addon site is still at version 2.1, not 2.1.1 as mentioned on Echofon's website (the one they offered when you install it from their website). If you are a mobile users (travels a lot) and you are concerned with your privacy when using public computer to work, then you might like the idea of using LPS (Lightweight Portable Security). It's another Linux distribution that focusing on privacy and it's built by Air Force Research Laboratory and USA's Department of Defence. So far, it has won several awards. I'm having a problem with my echofon at my desktop. I doesn't receive any updates at all even though it supposed to get them. I can post new tweets from my Echofon, though. This happened on my Firefox and probably on my Linux desktop only, since i have no problem with Echofon on my iPad. I have removed the .mozilla and start a fresh Firefox configuration and reinstall Echofon, but i still have no solution for this. I even asked Echofon's Twitter account but no help has been given up to now. Twenty years of works on Linux Kernel has passed and now it's time to start a new version and yes, it's Linux Kernel 3.0. Linus has made an official announcement but it's not yet available on the official website. Probably in a few hours or so, but it's now mirroring to all public computers that is curious about this new and shinny release. Don't expect that this release will bring major changes to the kernel itself, since as you may read from Linus' announcement, it's not really the same idea like in the previous major kernel release where something new was introduced. Linux Kernel 3.0 is released just to make the big number gone and also to mark twenty years of Linux Kernel development. KernelNewbies already got their hand of providing a human-readable information about Linux Kernel 3.0. I would recommend you to go there instead of looking at the detailed-changes in the ChangeLog. In the next 24 hours, there will be one big event happening, which is the release of Linux Kernel 3.0 by Linus Torvalds. He mentioned that on his Google+ account which was re-shared by many people and also recorded on GMANE. Actually, it's not as big as the introduction of Linux Kernel 2.2 or 2.4 and even 2.6, but this new numbering marks for a new start for the whole Linux Kernel development even if there are no major changes happening inside just as Linus said before. It's more likely to kill the big number at the third position (or we would have 2.6.40 if Linus didn't cut that out). By entering 3.0, Linux now plays an important role on many aspects of our life. Check out Business Insider's article about 12 Things You See Every Day That Wouldn't Exist Without Linux. I think they are all vital to human real life and that is a fact. Victor Porof along with Cedric Vivier and Rob Campbell are now working on Tilt: a new Firefox extension which allows you to visualize your web page in 3D. Sounds cool huh? Well, it's indeed a cool extensions. The visualization is drawn using WebGL, for dynamic, fast, in-browser rendering. It started as a Google Summer of Code projects, but it attracts more developers to join and the three of them consider this as an active developer project and this is how it turns out to be a working project under Mozilla Hacks. For now, the source code and the build is only available on GitHub, so you will have to grab it from there. They generously provided the link to the latest XPI, download the file, then open it with Firefox or drag’n drop it on Firefox. Apple has finally released Mac OS X Lion, a major upgrade to it's OS since Leopard came in 2009. This release has been previewed in the last WWDC and everyone seems so excited since it came with lots of new features and it only cost you $29.99 rather than the normal price of $ 129.99. Besides releasing Lion, Apple also announce a new Mac Book Air. In the past, Mac Book Air doesn't get too much attention compared to Mac Book Pro or any other iOS devices, but i believe that will likely to change after this release. Why? Because it makes the old Mac Book looks old and outdated. It came with a pre-installed Mac OSX Lion, so you don't have to do anything, but just play with it. We all know about how IT Project track record is. Since Standish group released their CHAOS report in 1995, there has been a lot of efforts spent to increase the success rate of IT projects in every area where industries plays a big role. However, the following report from the same group reported that even though there has been a slight improvements, it wasn't as good as everyone has hoped for. One of the main reason why IT projects often failed was because of poor management. Not many IT people knows how to manage a project because most of them only learned about IT skills while studying in university. They don't really care about managing other important things, such as human resources, cost management, time management, and many other knowledge areas described in the Project Management Framework developed by PMI (Project Management Institute). Since then, a certified Professional Project Management has been a growing demand all over the world. PMI as the official organization maintaining PMP certification has released PMBOK (Project Management Body of Knowledge) that is often referred as the official guide for taking the PMP certification. Many project management is based on the latest PMBOK which is now at 5th edition. By getting certified as a PMP, he/she is recognized as a person who has a competence in managing a project and understand project management framework in general and can apply them in their work. Since they have been acknowledged by the global industries, they will surely get more salaries than people who isn't certified. More sucessfull projects will also be happening under his/her leadership. PMP certification is not a free certification, thus those who would like to pursuit for PMP certification should have prepared themselves for some time and also meet the requirements before applying it. You can have a look on the requirements on PMI's website. uCertify provides a PMP prepKit for anyone who would like to take a PMP exam. The prepKit consists of quizes, articles, study cases, reports, performance review, and analysis tools so it's very suitable before taking the real exam. The prepKit can be downloaded from uCertify's official website and you can try the trial version first if you're stil unsure about it. All of uCertify's products have unconditional 100% money back guarantee, so if you can't pass the official test in your first attempt, you can ask for refund (this apply for a full version). Personally, i'm happy with this product as this product gives comprehensive chapter-by-chapter study and then i can start reviewing my progress by taking quizes and exams and the prepKit will track my personal progress so i can view my progress anytime i wanted. Since Project Management is a broad topic, uCertify also provides a lot of articles that is related with project management and this surely helps for people who wanted to see is happening around the world. If you truly pursuits for PMP certification, i would recommend you to try this tool before you take the real exam. uCertify has generously provided a 10% discount by entering UCPREP in their shopping cart. I would also recommend you to follow ProjectTips Twitter account as they often post about Project Management tips. Google Code is known as one of the most-used project hosting for many open source project around the world besides SourceForge and also GitHub. Initially, they only support SubVersion (SVN) as their SCM tool, but they have added Mercurial in 2009 which brings Google Code to another level because it has support for a distributed SCM tool. That doesn't stop Google to improve their work as now GIT is a popular tool since Linus Torvalds created it for the sake of Linux Kernel development and it seems that many developers like it and many of them have migrated to GIT. Even big players like KDE is also moving to GIT and so does it's biggest rival: GNOME. Other open source project that also uses GIT includes PERL, QT, Android, XOrg, and PostgreSQL. So what happened next is that Google has now officially added GIT as another options for the developers when they initially created the project. You now has three options : SVN, Mercurial, and GIT. If you have been working with SVN, you can have a look on the GIT Migration FAQ to migrate it to GIT. In the past, when someone asked me, what Linux distribution should i used for someone like me (a beginner), i would say Ubuntu or OpenSUSE or Mandriva because they are user oriented distribution that are focusing on common people compared to other Linux distribution. But if you asked the same question to me right now, i would say Linux Mint is the definite answer. Looking at how they evolve this past few years, Linux Mint gained lots of user base recently, mostly after the release of Ubuntu 11.04 since they constantly changing their products with new features that (i think) is too premature to be used in desktop environment. Most users doesn't need radical changes just to enjoy a nice desktop that is fully working out-of-the-box. This is what Linux Mint gives to their users: a working system out-of-the-installation that is easy to use and very user friendly with a nice and consistent graphical interface, something that Ubuntu is lacking lately. Lately, i saw lots of Angry Birds accessories displayed on many store around Jogja and probably around the world as well. Even though Angry Birds is considered a new game, it has become a trend setter for some people and the business person saw this as a big opportunities as many people played them on PC, Android-based phone, and of course iOS-based devices such as iPhone, iPad, and iPod Touch. The accessories sold out there resembles what has been sold in Angry Birds Online Store, but since most of it are made in China, they don't have the same quality with the one sold in the online store. Today, i got two similar requests to become a writer contributor for two different websites, but both of them talks about Technology. The first one came from my old friend Krishnan from India where he asked me to join E-Dirts. He wanted me to write articles about Linux in general. I haven't met with the owner yet, but it seems interesting to me even though i haven't decided it yet for now. The second request came just four hours ago from Techo Grate. I talked with the owner and after a small discussion via email, i decided to join them as an independent writer talking about Slackware Linux and open source applications. Both of the sites are owned and ran by Asian's people: the first one was from Bangladesh, and the second one is from India. This morning, i saw my student's post on Plurk about a commercial ads posted on YouTube. It was Pantene's who made this and the title of the video is Extraordinary Pantene Commercia. I found it very touching and it also has a moral story "Why do you have to be like others when you can do something more"
For some people, open source application has been replacing proprietary on their system, organizations, or even their desktop applications, but with this news, it should be more than that. Cynthia Harvey has written an article about 63 Open Source Replacement for Popular Financial Software on Datamation. It lists 63 open source applications that is targetting financial software, which i think is where Open Source is way behind proprietary software. We hope that more and more open source applications are being developed so that it can be used in more critical areas such as finance, medical, government, and many more. Android is abig player on the mobile market. It's growing exponentially and it's competing with Apple's iOS alone right now. But somehow, their Android Market is not so safe for common users as there has been a lot of news related to malware spreading through Android Market. The latest one is the discovery of new malware applications by Lookout Mobile Security targeting the Android mobile operating system. There are four infected apps (Quick FallDown, Scientific Calculator, Bubble Buster, Best Compass & Leveler) were published to the Android Market by a developer by the name of "MobNet". This is the third time that DroidDream or one of its variants has been discovered in the Android Market this year. DroidDream was first spotted in early March, after which Google pulled more than 50 applications from the Market. At the end of May, the DroidDream Light variant surfaced and Google removed a further 34 apps. The latest malware was quickly removed by Google, limiting the total number of downloads to 1,000-5,000, according to Lookout. Google should have done better to prevent this kind of threat by adding some verification phase before a user-submitted apps gets published on their Android Market just like what Apple did. It will not prevent users to download from third-party repositories, but that will be their risk by doing so (just like when we wanted to install from Cydia and third party repository providing many other iOS apps). After months of development, finally the updated version of phpBB 3.0.9 is now out for public. This release is dubbed as a maintenance release, meaning it fixes LOTS of bug fixes, but also it introduces two new caching module, called WinCache and Redis and also it can limit amount of failed login attempts per IP. I have completed the update process in Indonesian Linux Forum and hopefully there are no regression found on this release . Let me know if you found one though. Last May, i posted about Disconnect to Connect, which was an ad posted by DTAC Thai in YouTube that should *slap* people who are addicted to electronic gadgets and forgot about their surroundings environments. They only care for their devices and go to Twitter, Facebook, and other social networking sites and instant messaging clients. Well, apparently, there's a new (i just found it today) video that has the same title "Disconnect to Connect", but this time, its more targetting Facebook users. We all know that Facebook is a popular social networking site which now has around 700 million users around the world and keep growing. It has created a new world for some people so that they could share information, photos, videos, and do lots of things in Facebook. Unfortunately, most people get addicted to Facebook too much and this could cause lots of negative problems, most likely anti social people. Firefox is now following Google's release cycle and they plan to release Firefox 7 before 2011 ends. Right now, the stable version is Firefox 5, but that will change in the next month as Firefox 6 is now on Beta channel, means one step closer to reach stable channel where Firefox 5 is standing. If everything is according to Mozilla's plan, we will have Firefox 6 ready by August 16. If you are curious on the very latest work on Firefox, you can check Firefox 7 which still sits nicely on Aurora (Alpha) channel and it will be released by end of 2011, just before 2012 if nothing brakes. If you play in web-app testing field, then you might have heard about Selenium. It's basically a testing tool designed for web applications and it has been around for some time. I first noticed it's presence around 2004 when i was working in Jakarta. At that time, i went to an event called JAX Asia and that's when i first met Selenium. Since then, i have been using it for my personal project and also for my teaching material when i'm teaching for testing processes. It's really a great tool. The good news is that now they have released Selenium 2.0 which basically a major upgrade which brings many interesting features, such as modern browser support (IE 9, Firefox 5), new WebDriver APIs for Python, Ruby, C#, and Java. I believe this could enrich Selenium base support to even more programming language in the future. If have an iOS devices (iPod, iPhone, iPad) jailbroken, you must likely to have Installous application from Hackulo repository on your devices as well. It's a great apps and i would recommend it to you. Lately, after upgrading to iOS 4.3.3 yesterday, i reinstalled my Installous 4 and i got an API error every time i do any actions on Installous, whether it's searching, browsing, or even at Installous start up. So, i was curious about it and search on YouTube and hey, i got this nice working video and i tried it on my iPad and it works. So, if you have problems like me, just check the video below and go fix it. Credit goes to the author. Two of G7 members will be leaving very soon. One will go back to US and the other one will go to Germany. We had fun together for the last two weeks and it's time to go back to their normal activities: working. In the future (in about six weeks), Google will rename Blogger into Google Blogs. This rumor was first released by Mashable and i think the reason makes sense. Many users doesn't know that Blogger is one of Google's product, just like GMail, Google+, and many other Google's products. By renaming and use Google in front of the product name, people will have an awareness that they are using Google's product. I think it's a common way for organizations to put their brands on everyone's mind. Google bought Pyra in 2003 and they keep the original name as Blogger, but they keep updating and adding more features into Blogger until what it had right now. It has become a serious place for blogging and many users (including me) like what Google has done to Blogger. It's been a wonderful place to write our post without having to worry about the hosting, security, availability, and many other things to think if we use other products. This rename process will not only affect Blogger, but also Picasa. It will be renamed Google Photos. PHP Team is moving forward by releasing PHP 5.4 Alpha 1. This release is HIGHLY unstable and SHOULD NOT be used in production environment. This release is more likely intended for developers to try and test whether their code will break on this version since it added new features and removes some legacy behaviours. PHP team also released PHP 5.3.7 RC 2. This is an updated release for the upcoming PHP 5.3.7 which i predict will be released on late July or early August. Me and my G7 members will held a BBQ party tomorrow. This might be our last BBQ party before Andre leave to US and Yohan leave to Germany, back to their daily activities: working. Our next meeting will be next year or perhaps two years from now, so we would like to spend our time together with the rest of the group members that are still in Jogja. They had a party in Purwokerto, Anton's hometown which is 5 hours away from Jogja. Some of our colleagues went there, but some didn't go (me for example) and i feel sorry for that. CWE and SANS Institute had published a study into the 2011 CWE/SANS Top 25 Most Dangerous Software Errors that leads to critical and security vulnerabilities in software. This is a yearly study and it's used as reference for other studies. As always, injection-based attack dominates the top 25 and SQL Injection is on the top of the list. Although this vulnerabilities is so common, still a lot of system are vulnerable to this kind of attack. As you probably aware, SQL Injection happened when the system failed to validate an input (mostly are conducted at query string in the URL), thus leading to unauthorized data modification or alteration in the backend (database). The second position is OS command injection, followed by the infamous buffer overflow attack. GMail has released two new themes that looks very nice called Preview and Preview (Dense) which you can activate in Themes tab. I have activated this two themes and i think there isn't much difference between those two (or i can't really see the difference yet). From usability point of view, the font has been increased a bit, so it's more visible to users. In overall, they make the design quite minimalist (as usual from Google designers).